WDR on governance: paradigm shift or cosmetic procedure? 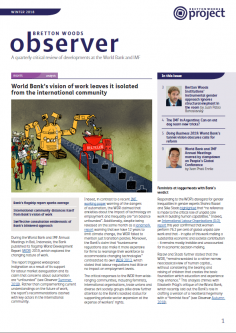 During the World Bank and IMF Annual Meetings in Bali, Indonesia, the Bank published its flagship World Development Report (WDR) 2019, which explored the changing nature of work. 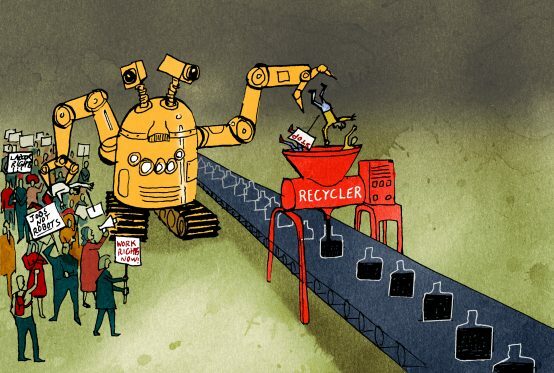 The report triggered widespread indignation due to its support for labour market deregulation and its claim that concerns about automation are “unfounded” (see Observer Summer 2018). Rather than complementing current understandings on the future of work, the report’s recommendations clashed with key actors in the international community. Indeed, in contrast to a recent IMF working paper warning of the dangers of automation, the WDR claimed that anxieties about the impact of technology on employment and inequality are “on balance unfounded”. Additionally, despite being released on the same month as a landmark report warning that we have 12 years to limit climate change, the WDR failed to mention just transition policies. Moreover, the Bank’s claim that “burdensome regulations also make it more expensive for firms to rearrange their workforce to accommodate changing technologies” contradicted its own WDR 2013, which stated that labour regulations had little or no impact on employment levels. The critical responses to the WDR from wide-ranging communities, including feminists, international organisations, trade unions and diverse civil society groups alike drew further attention to the Bank’s isolated status for supporting private sector expansion at the expense of workers’ rights. Responding to the WDR’s disregard for existing gender inequalities within the labour market, gender experts Shahra Razavi and Silke Staab highlighted that “no reference is made to the critical role of unpaid care work in building human capabilities.” Indeed, an International Labour Organisation (ILO) report this year confirmed that women perform 76.2 per cent of global unpaid care work and that – in spite of this work making a substantial economic and societal contribution – it remains mostly invisible and unaccounted for in economic decision-making. Razavi and Staab further stated that the WDR, “remains wedded to a rather narrow neoclassical view of human capital…without considering the bearing and raising of children that creates the basic foundation which education and experience may enhance.” This analysis chimes with Elisabeth Prügl’s critique of the World Bank, which recently laid out the Bank’s role in crafting a version of a neoliberal hegemony with a “feminist face” (see Observer Autumn 2018). Responding to its publication, which took place just days after the event, Oxfam stated that the WDR’s central rationale – deregulation – is discredited, and that it casts serious doubts over the Bank’s commitment to inequality reduction (see Observer Spring 2018). In contrast to the WDR, the World Inequality Report 2018, a World Inequality Lab annual publication on global inequality trends, identified that better paying jobs are key to addressing sluggish income growth of the poorest half of the population, adding that “healthy minimum-wage rates are important tools to achieve this.” The report further stressed that the “global top 1% earners has captured twice as much of that growth as the 50% poorest individuals.” This is a fact of particular concern ten years on from the financial crisis, as David M. Kotz notes that the seeds of systemic crisis stem from growing inequality and a financial sector absorbed in risky activities and a series of large asset bubbles. ITUC General Secretary Sharan Burrow stated that, “Support for further deregulation will only reinforce strategies of platform companies to subvert employment relationship rules, increase precarious work, pay poverty wages and undermine workers’ rights.” An ITUC report earlier this year found that workers in the informal economy are particularly vulnerable to abuses, as they are exposed to inadequate and unsafe working conditions and often earn less. On the WDR’s mention of Universal Basic Income (UBI), the ILO stated that the report does not provide sufficient detail to show how a UBI would guarantee the minimum social coverage. Indeed, earlier this year the ILO issued a report arguing that while some UBI proposals can enhance redistribution and social justice, others could result in the corrosion of social protection and reinforcement of a small-state neoliberal model. The superficial consultation process during the report drafting supported long-standing criticisms that the Bank is unwilling to listen to external voices. The WDR’s publication followed a year-long effort from coalitions and organisations around the world to highlight the inadequacy of its initial findings and recommendations and attempts to re-shape its findings in line with international standards. Once the draft WDR was published in early 2018, its failings were widely documented by academics, trade unions, networks, and national and international press. A letter was sent from six global unions and over 80 civil society groups, think tanks and academics, asking that the WDR, “be rewritten to instead promote decent work and inequality reduction, and that this be made clear when the report is presented to the Executive Board.” Despite these efforts, the final report remains strikingly similar to the initial drafts, with only a small handful of alterations, such as a U-turn on support for zero-hour contracts. This approach brings into question the extent to which the World Bank has addressed concerns about its knowledge production raised in the 2006 Deaton Report, which accused the Bank of having a self-referential approach to research and learning that, “rises almost to the level of parody” (see Observer Summer 2018).